All my wigs are brand new and will fit the average ADULT size head. Fun new costume wig from Lacey New York called Rod. 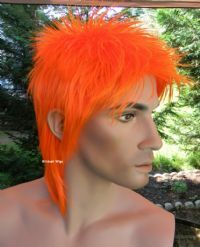 This is a Rod Stweart/David Bowie style wig for men or women. This seems to run a bit on the larger size but the cap is adjustable. The hair is about 2 to 5" all over. This listing is for the color pictured, which is Bright Hot Orange! I also have this in Bright Hot Red on a different listing. For health reasons and state regulations ALL WIG SALES ARE FINAL. Sorry, there are NO EXCEPTIONS! Would you want to wear a wig that someone else was wearing? You would be in serious risk of catching head lice! Be assured that the wig you purchase from me has NEVER been on a human head! 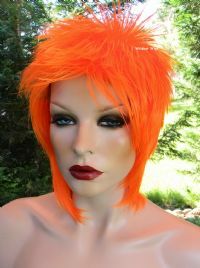 Please check my other great wigs, and save on shipping costs. Thanks for shopping WILDCAT WIGS!